Have you ever gone through the process of producing a TV spot or online video ad for your college? Were you happy with the quality of the production in relation to the costs? Is your school “obligated” to use students to produce your branding videos simply because you have a video production program at your college? Do you struggle with the decision to use students in your spots? 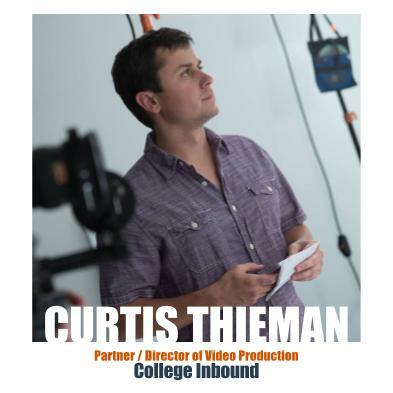 In this month’s podcast, we speak with our very own Curtis Thieman, partner and director of video production at College Inbound, about these issues and ways to make quality video production affordable. We discuss the video commercial that we shot which allows EVERY two year college, the opportunity to have a national quality TV spot, customized and delivered within days. Listen to the podcast for an exclusive discount offer on VaaS (video-as-a-service). Learn more about VaaS and sign up for your next commercial here. Alright, welcome Curtis to the college marketing podcast. This is kind of unusual for you. Usually you are the man behind our video audio productions. So you’re not usually in the thick of it. Yeah, I try to avoid anything that would, uh, allow people to see my face or hear my voice. So this is fun. Usually on the podcast we have a guest from a community college. Today we’re doing something a little different, which is something we really try to avoid that’s talking about ourselves. So most people know us as a website development company for two year colleges, but we actually provide a lot of video production services for people, which seems like a weird thing. Seems like a random mix to be doing web development and video production. So I thought it’d be, it might be kinda cool and make sense for people, for our listeners, if we could kind of, you know, take a stroll down memory lane a little bit. Give people a little background on our business, our story as business partners and uh, uh, kind of go from there, but we go back a little ways. You and I.
Yeah, we, uh, we met in middle school. Yeah, right. I think it was a, yeah, sixth grade gym class, something like that. Maybe some after school basketball programs and yeah. Um, been a little while, has been awhile. And then, um, I think it was a long hiatus there and then you and I just happened to take a class together our senior year and it was, what, do you remember what class that was? I believe it was yearbook. Was that the, was that the name of the class was? I think it was his yearbook or yearbook class. Yeah, we would, uh, we put together the high school yearbook. We sure did. And I think what’s crazy is, you know, so many years later we ended up starting an advertising agency together and we kind of started it in your book. Yeah. So I think all the credit goes to our teacher Ms. Noggle. The crazy thing about Ms. Noggle is we did a, uh, we shot a commercial for Rowan Cabarrus Community College, which is probably two hours away from where we’re originally from. And when I was doing research for that spot, Ms. Noggle, our old yearbook teacher works there. She works at Rowan Cabarrus? Yeah. Well that’s a shout out to Ms. Noggle, who inspired it all. And I’m sure who listens to this podcast. You know she does. She has to. Well, she’s going to, I’m going to email it to her. OK, good. All right. You and I became really good friends our senior year. We went to East Carolina together. That’s true. We were roommates, both went through the school of communication together. And then, uh, from there we started a company called Inspire back in 2005.
yeah, absolutely. I think, you know, we spent a lot of years kind of being a full service marketing agency. We were kind of all things to all people, right? I guess. Yeah, that it was OK. Yeah, it was, it gave us good experiences in different places, but it’s just not a way to sustain a profession to, you know, we’re just trying to do too many things and um, you know, we talked about specializing for years and then when we started doing it, we, I instantly regretted not doing it sooner. Yeah, we were doing some work for Wayne and they wanted a commercial and we actually pitched the concept in the meeting when we were talking about, you know, they said they wanted a commercial and I remember we just kind of kicked things around the table and we pitched the concept, um, you know, after that and just ran with it and won a paragon award and a few others. Yeah, it won a Silver Telly and a regional Addy Award. I believe. Yeah, and the Silver Telly is like the highest you can get, right? They don’t have Gold Tellys, it’s just Silver and Bronze or something. Right. I think you can. I think there’s a national, if you, if you get a. Oh no, that’s Addy. Yeah. I think Silver Telly is as good as it gets. So tell us a little bit about what and what went into that from a production standpoint and actors and all that. statistically speaking a was a child before an adult. Um, so, uh, you know, and then that idea of telling a story, it really opened our eyes to. Because we’re not seeing a lot of the campus, you know, I mean, so many commercials that you see, it’s just, it’s footage to the campus. It’s people in the classroom that doesn’t speak to me personally. It’s just b roll. As a storyteller, I don’t react to that. I think. I think in the end my experiences, people respond more to the human story and looking into people’s eyes. And, and seeing their hopes and, and, and what they want to be and that’s why I think Wayne worked so well is as we saw kids and then we saw adults living out their dreams and you know, you kind of associate with a measure as you’re seeing them and hopefully relating and having that commercial means something to you. I talked, I think we’ve heard multiple people say that their commercial made them cry or when I was like, wow, I didn’t expect that. Especially people like whose kids were going to college that had a very strong affinity towards it. Right. Maybe they were crying because they were so happy the kids were in college. Uh, I don’t know. It’s a very high quality spot. So I either really. Yeah, I’m sorry. We know our goal with that, you know, to have that regional to national quality spot, full air using this concept where you have the kid, the child actors who become the adult actors. So there’s a lot that goes into that and which gets expensive, right? I forget how many days we shot that. I want to say we shot for three days. Uh, we had, uh, we had a crew of probably about five, six people and then we use high end equipment. Uh, and that’s, that just adds up. What kind of crew to do you typically have on a spot like that. So typically we’ve got camera operator, we’ve assistant camera. We have, depending on what the format is, you have audio. I think in Wayne we didn’t, we weren’t recording audio, so that was one thing we could cut out, but we usually have two to three people on lighting and then we have somebody on hair and makeup. Sometimes we’ll have w, well we always have production assistance, but sometimes we have set decorators or an art department who are building props or, or whatever it is we need involved in the spot. So there’s a lot more that goes into it than people think. Uh, you know, they’ll say, hey, I want to commercial. Well, you know, what are, what, what all are we putting in and not everybody can, can do what Wayne Community College wanted to do, um, we went above and beyond a. I’d say our margins weren’t as high up on that as, as we as they could’ve been, but we wanted to, you know, put everything into that because we saw an opportunity to really get in that market and do some other work there. Well, I know there’s not a typical spot, but I mean, not to put you on the spot, but you know, what’s kind of a typical price range for something like that in our wheel house that we go with. I mean, it’s hard to say, uh, you know, different markets, you get different things, but for that size crew, in most places, you’re looking between $10,000, $20,000 at least and depends on the concept. If you can shoot all within a day, you’re probably on the lower end. Uh, you know, it’s just, there’s so many variables that go into production. Uh, you know, you have your actors, you have your locations, you have your props and your set decorations. And then you have crew, you’ve got effects and you know, if there’s any animation and visual effects. And it really comes down to concept and what has to, what’s involved in each one. I know I was at a, um, conference for community college professionals in North Carolina and I was showing the Wayne’s spot to somebody and they said, why can’t you just take off their logo and slap ours on there? And it’s like, well, we can’t do that. But then I was kind of like, we could do that, right. Um, obviously we’re not going to take their spot, but we could create a new spot that applies to community colleges and put that together. Yeah, I remember I came back, we started talking about the service, that platform and what we could do there. And you know, it seemed like an idea we should have had sooner will not. It wasn’t even our idea. So, uh, it’s such a good idea because community colleges have the same goals. They, a lot of the same programs. They are, they’re dealing with the same obstacles. And one story that would speak to a group of people on the east coast would also speak to the same group of people on the west coast. Uh, so it just made a lot of sense to try to figure that beast out. Right now in community colleges typically have their, their territory set, right. And uh, there’s not a whole lot of overlap and they try to keep it that way. So I’m for one ad to be running in one market and another one to be running in another wasn’t quite as big a deal. I think not every community college has the budget or has the stomach to go in and produce a $25,000 custom spot. Right? The opportunity we saw with VaaS, um, our video as a service, we can tell a story, put that same production quality into it. So we, we spend $20,000 making it and we can essentially resell in different markets a customized so that they’re getting a high quality production that has been customized for you. Um, but you don’t have to go through the process of a one finding a production company. You Trust, ah, that’s going to take care of that money because there are a lot of terrible filmmakers out there who would love to have that kind of money. The ability to see a story before you pay for it. I mean, just, that’s really huge. That’s huge. Comes from storytellers and it’s for specifically the two year programs. We didn’t just dump $20,000 of her own money into producing the spot. Um, so, so tell us, you know, what we did to kind of get this kickstarted and kind of what that process was like. Yeah, yeah. What we did is we wanted to put forward some of our resources, but we wanted to try to supplement that because it would be risky to just spend $20,000 in cross cross our fingers. So what we did was we discounted VaaS for a limited time and we looked for five partners, essentially people who could look the Wayne’s spot and say, OK, I trust you guys are good storytellers, good production value, you understand the market. I trust that you guys can put together something that we can make work. So we had five schools, uh, that said, hey, we’re, we’re in, we discounted it. Um, so that it was really a slam dunk, a little bit of trust, you know, took it a little bit of time. But to date we’ve had really good feedback. Uh, it’s allowed us to make a solid product and a solid commercial that really works for a lot lot of people and it was a win-win. One of the things that we allow these people that first hopped on the bandwagon with this was we kind of allowed them to be part of the creative process. Um, we wanted their feedback on which direction to take with this. And I tell you, I go to a lot of community college conferences and one of the things I always, always here is, um, you know, you have these complaints if you’re a director of marketing at a community college and you produce a spot or an ad or something and you feature a program, an academic program, and then you hear from another academic program who’s like, why didn’t you feature my program in this spot? You know? And so I, I had, I was like, Curtis, we’re not going to put academic programs in this spot, we’re gonna we should sell the story of the student, of going on a journey, right? But let’s not, let’s not focus on a particular program, but the overwhelming feedback we had from these, this first group of colleges was they wanted to, to work in some academic programs and what’s kind of a challenge for that, if we’re trying to sell this thing nationally. Right, right. Well, um, there’s a lot of challenges. Uh, so we had to develop some kind of concept where every school could have specifically the programs that they wanted to have within the concept. And we also had to make it work and flow. So we wrote and we rewrote and we rewrote different concepts, uh, with, with this one, we came up with a great structure. Essentially it was kids on career day, standing in front of a classroom talking about when I grow up, what I want to do and what we would do is flash to what they’re envisioning. Um, and what we did was we structured it so that any school or any college could come in and say, OK, I want that product and pick which of which three programs that they want to use. And we shot I think five or six different, um, different programs is actually. I think there’s an eight that we have shot. We haven’t finished that, but. So there’s, there’s seven different programs ready to go. So anybody who comes in and we shot some of the more commonly requested programs, the programs that people said, you know, we have early childhood education, emt nursing, you know, these are the programs that we’re pushing. Um, we have an animation, video production, culinary, early childhood education, EMT, law enforcement, music, audio and a nursing, like you said. and speaking to that, like how do we customize that spot for the college? So, uh, once they picked their schools, uh, will the academic programs or I’m sorry. Yeah, when, once they, once they pick the programs, ah, we’ll do the edit, will write a voiceover that has elements of what campaigns they’re running. There’s any wording that they’re using in their marketing materials. We can incorporate that because it’s a custom voiceover. There’s a certain spot that we kind of plug that in at, uh, because, you know, we have a general formula, but we write that voiceover a, put that in place. And then we put a graphics package. We’ve got, you know, the websites in there. And then we, we, we custom develop in-house a animated logo. Some logos look better and a 2d animation or 3d. We reserve the right from a creative standpoint, what we think would look best if people had an existing animated logo, it’d be no problem for us to just plug that in. But most most colleges that we’ve, we’ve worked with today don’t have that or they wanted a refresher so we’re happy to create an a nice animated logo, put it at the end, just wraps everything up really nicely. And, and all of these pieces, the footage, the voiceover, the animation, all of those are done in house by our team. So everything is customizable. We allow for feedback. We give it to you and say, OK, do you have any changes? There’s that back and forth and that, that freedom to change it up. We actually just got contacted one of the commercials that we rolled out last year. They just contacted us saying, Hey, can you change up the programs within it? And it’s not a problem or just switching out pieces. In this case, we won’t change the voiceover, but it’s really easy for us to make those changes. OK, so how are the schools using the spot? So most of the colleges are using it online. I’m. They’ve got it linked on their website. If you go to the home page, you can watch it or if you go to a landing page, they’re using it on facebook. Youtube, they’re, they’re playing it wherever they can and social media and email campaigns are pretty much wherever you can use it. You know, we really have intended this to be more for digital media. I know that some have used it in movie movie theater advertising. If a school wants to use it on tv, we’re kind of working with people on that. We’re trying to make it so that if you’re running this ad and we don’t want a community college that’s right next door to you also running this very similar ad in the same TV market. So what we’ve kind of done is if you are the first one in your market to become a part of this and subscribed to the, to the VaaS, a licensing for this commercial, then you have the opportunity to, to use that on television before anybody else does. And then if anybody else kind of comes into it, that could really just use in digital media. So it’s kind of on a case by case basis. I think it’s important to note that, uh, we haven’t encountered that yet. So we have, as the competition goes, you know, there are a lot of two year programs throughout the nation. We have this ad running in a handful of states and that literally stretches coast to coast. Um, yeah, I think we have one in California. There’s one in Florida to the. Yeah. So we’re really coast to coast, but it’s just a matter of if for some reason, if you bought a license or if your college got a license to this, you would, we pretty much give you first right of refusal to make sure that you don’t have your competition coming up with this ad because we don’t want that will have other products. We’ll have other videos that people can, can select if they want a. But the last thing we want is you and that your neighbor in college to be using the same a commercial in the, in that market. So, um, but I don’t foresee it being an issue, uh, just because there’s so many and we’re going to have different products. The VaaS spot that we have right now is kind of a really good branding spot. It could be really good for registration campaign, kind of overall campaigns for the college. But there’s some other areas. I know we’ve talked about. Dual enrollment is huge right now. Online classes, you have college transfer programs then you have continuing continuing education. One thing that we’re gonna want to do is just get feedback for you guys out there, you know, you know, what makes sense, what of all those things and maybe things that we’re not even thinking of what do you really need help pushing with the digital media campaign that maybe needs to be explained through video or inspire through video that would help you. Some kind of challenge that isn’t unique to you as a school or were unique to a program. Uh, some, some kind of challenge where you say, Hey, we have this problem but so do all these other, all these other schools and if we think it’s a viable, workable thing we’ll develop a high end piece of content for you that you can then just turn around and license as you need it. Yup. So how much does this cost and what do people get? All right, so we have some other products we’re going to be rolling out, but right now for the spot that we have $4,500 for a one year license and that’s everything. That includes everything. So you get rights to. We actually do two versions of the ad for you. We do a 30 second, 60 second. Um, you know, we’re, we’re also happy if, uh, if you needed some other format or some other length, we could, we could probably accommodate that, but right now it’s $4,500 for the year. You get those two versions, you get a 30 seconds, 60 seconds, and that includes, you know, the voiceover that’s custom graphics that are custom. The animated logo, the animated logo. Yeah, I mean you get full use of it wherever you want to use it. And like I said, this is our first year doing it and we’ve had a great response. People are really excited about it. They’re already asking what we’re doing next. Um, but to have those two pieces of content they can just throw all around. Uh, I mean, yeah, it’s just great value. Do you think anyone actually listens to this podcast, Curtis? I, I know I do subscribe to guys and planet money. That’s what I listen to. Well I tell you what? What do you think about giving a discount to people if they mention this podcast. Uh, yes, both of them are going to call. This is usually how we make business decisions live on podcast. Yup. Just throw that at me. Now if somebody wants to go and take a look at some examples of the spots that we put together for other community colleges to request a custom spot to, they want to sign up for this. You get a college inbound dot slash VaaS, which is v. a. a. s. as in video as a service. Let’s say somebody, they really want to sign up with this and they need help pitching this concept to their president or committee. We have even helped people buy kind of pre mocking up a, you know, we could, we could go ahead and just slide into our logo and put it in their web address. We’re not really doing a custom voiceover but, but we’re willing to help you were willing to spend an hour kind of putting it together and I’m giving you something that maybe can help somebody visualize it because sometimes when they see branding for another school and they’re, they’re like, I don’t get it. This has another school’s branding on it right now. instead of being like, well, we don’t have nursing. Why is there a nurse in this spot? A little bit we’ve learned is it’s really hard for people to use their imagination sometimes. Are there certain people that just are better than that than others? So a non-marketing for non marketing people. Well actually we should probably get that out because most people on here and I guess most of these people are marketing. No, they’re OK. We can keep it now. Now I’m just blabbering anyway. Um, yeah, no, I think, uh, you know, another thing that’s important is we want people to see us as a resource. If somebody has an idea, let’s say you had an idea for a great commercial, we would be open to hearing it. I mean, it’s one of those things that we will, one, we do custom work. If somebody wanted us to create a custom commercial, we’ve done that multiple schools, but we also are looking for products to put within VaaS, so if there are concepts or if there are ideas or if we’re, if we’re just not filling a need, you know, please reach out and, and please held Jonathan with these ideas because we want to be putting out content that people want. And if it would for your school then it would probably work for others. Uh, we’re going to be producing. I guess I can go ahead and say it on here. We’re going to be producing two new, a VaaS products this year. Uh, that’s the plan for right now. So at, by the end of the year, we’ll have three products that you could, you could pick her choosing license and we’ve got a few other things that are exciting to, but if there’s something that you want to see that you’re not saying, let us know. One kind of funny thing about this. So, so we have like five or six different community colleges running the spot right now. Um, you know, some were spot and we didn’t really expect this. I know last year we won a gold paragon award at the NCMPR Conference for um, uh, the Wayne spot. Right, right. And we just got word that one of the colleges submitted for Paragon Award and they’ve won something. They don’t know what they’ve won yet. Right. But they are a winner. we’ll, we’ll find out in Vegas this year so we can, like you said, we can still do custom commercials for people. MMM. Yep. And uh, I know some people have considered this video is a service and they’ve went ahead and said, hey, we want a custom spot. And I think one thing we should point out is, I mean, you do with all the video production work that we do. I mean, you go all over the country doing video production. Yeah, we travel. We’re were used to travel and uh, we’ve got national clients who fly us around North America mostly. Uh, so yeah, we were, we’re not, I’m a stranger to flying into an area and hiring crew there. So it’s not like we have to bring an entire crew if we needed to make a commercial in Kentucky or in Washington state, you know, we’re based in North Carolina, but we, uh, you know, well, just for example, we were distinct Kentucky in Washington state in the last six months. So, so we’re, we’re used to travel, we’re able to travel, um, we’d like traveling most of the time. It’s nice to stay home sometimes too, but, uh, you know, we’re, we, we like storytelling and wherever that takes us. sure, sure. So, um, we have a studio in Wilmington, North Carolina. Uh, we are down the street from a much larger studio called screen gems. Uh, what’s one of the largest studio is east la, but uh, for those not familiar with Wilmington, North Carolina as a little bit of a hotbed for film for a long time, a, they’ve done everything from like the Ninja turtle movies. The first two, not that third atrocity a, they’ve, I mean, there was an iron man movie here. There was Dawson’s creek is in One Tree Hill or kind of famous for being here. Having those resources, um, re really anything we shoot has crew from that film world. So we’ll hire grips, gaffers a will hire pieces of from the that community. Uh, we, you know, most of what we do is more on the corporate side, but we’ve worked in some television and film here and there too, um, but being in Wilmington we have access to a lot more. Uh, like I said, we have a studio here and then we’ve got just a team of people around that allow us to really do this quality for a lot less than, than others can do. And that’s really how we got to the point where there are a lot of commercials we’ve made that, uh, you know, we’re saying things like [inaudible] go other places and you’re spending twice that. Oh yeah. I mean we just have really talented people. I think a really good example of that is our director of photography that we used on the vast spot is, um, he was, he’s a camera person on A Chef’s Life, which is a national PBS show. He was also on a nascar or show that’s actually about it blow up. So, uh, yeah, I mean our crew, for those who don’t know what a director of photography is, cinematographer essentially the person in charge of the image specifically with, uh, and the, and the art on that side. But um, yeah, I mean we have our bases in house, so our writers or producers, I direct a lot of our stuff that is all in house. So we have that consistency and we have that, that kind of starting spot. But the pieces we put together, our film people, our hair and makeup people are our lighting, our sound, all those people are coming from film sets kind of in between jobs, uh, and working with us. So we’re getting a mini version of Hollywood and they’re in our backyard. So it really helps us, especially when we’re able to produce things here. Like that first vast commercial, a wing community college was w, you know, they’re not too far away for us a couple of hours down the road. But uh, we brought our crew to that. Um, so, you know, that is a benefit that we have. And, and I think that’s, that’s been huge and establishing us, I think being able to do this type of work, I think you have to be near a community of some sort because it’s hard to do all these things in house. If we were in the middle of nowhere, I don’t know how it would have to do all these things well and we do some things well but it would be really hard to put together a film crew of people that you keep employed full time year round. So one thing that we hear sometimes is, well, we have a video production department grants on a academic program and we need to have students make our commercial for the college. do you have the business program running right about the marketing department? Is the marketing department running the marketing? Uh, you know, it’s, it’s one of those things that I think absolutely if you have a department, a, a film or a communications department, they can be doing content for you. Absolutely. On this day and age you have to be putting out content, I think. I think everybody knows that at this point, but to do those higher end pieces. Yeah, sure. You could rely on them to do it. Are they going to tell a story? Is it really, are you doing a commercial to do a commercial or are you really trying to like attract people? Are you really trying to engage people, get them excited about coming to your college? I’m not saying it can’t be done, but I think it’s, it’s a tall order. It was hard for us, you know, we’re professionals who’ve been in this industry for 13 years. Yeah, I, if you can do it, hey, more power to you. But a good luck. I mean, you know, the goal is to have that suspension of disbelief. Have People Watch it and forget they’re watching a commercial and just experiencing a story. The production value’s not there. People are kind of picking apart like, you know, oh, that, that was kind of Hokey here. That that’s not a real, that’s an actor that’s not a real person doing this or I know that guy and you know, he’s a, he’s the town Weirdo. I seen the commercial, all kinds of problems. There is all kinds of problems. So where do we get the talent from for these spots? OK, so someone goes on our website, they fill out the form, they selected all the programs that they would want to have in their spot. Right. Um, how many days does it take to get them a spot? Thanks for having me it’s good seeing you again. Yeah, you too, I see you everyday. I like seeing your face. Just about. Just about. When I get to hear my voice when you edit this video. This is for you, Jon.